Laurie Shannon-Bailey, Founder & CEO of the Coatesville Area Juvenile Justice Alliance; Lieutenant Nicole Palmer, Commander of the Staff Services Section Pennsylvania State Police Troop J; and state Senator Andy Dinniman at the recent National Juvenile Justice Week event held at the Chester County Public Training Safety Campus. 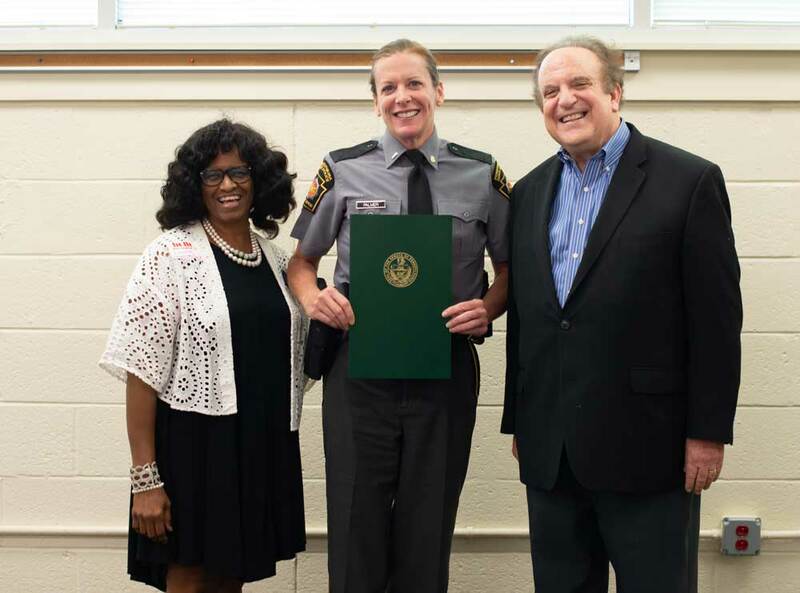 COATESVILLE — State Senator Andy Dinniman recently joined officials from local and state police departments to recognize National Juvenile Justice Week. “Juvenile justice providers fulfill a vital mission in holding involved youth accountable for their actions, engaging them in activities to restore victims and communities, and ensuring sufficient opportunities to move them toward productive citizenship and away from further criminal activity,” Dinniman, who serves as minority chair of the Senate Education Committee, said. “And it’s doubly important that we continue to work to provide stable environments for at-risk youth, including educational programs geared toward skill-building and career development, to prevent criminal activity before it occurs. “It truly takes a community effort and it’s fulfilling to see juvenile justice and law enforcement professionals come together to discuss how we can do better for our young people,” he added. Th event, held at the Chester County Public Training Safety Campus, was organized by the Chester County League of Women Voters (CCLWV) and the Coatesville Area Juvenile Justice Alliance (CAJA). Members of CCLWV attended to register voters and distribute information on voting. In attendance were officers from the City of Coatesville Police Department, the South Coatesville Police Department, the Caln Township Police Department, the Valley Township Police Department, the West Caln Township Police Department, and the Sadsbury Township Police Department, as well as Troopers from the Pennsylvania State Police Embreeville Barracks. Dinniman presented special Senate Citations to all the police departments present and thanked the officers for their ongoing commitment to public safety and juvenile justice initiatives that have a sustained and positive impact on the community. He also presented his Senate Resolution 424, officially establishing Juvenile Detention Center and Alternative Programs Week in Pennsylvania. Downingtown Mayor Josh Maxwell presented a “Good Neighbor Award” to BUILT Fitness (of Downingtown) for partnering with CAJA to mentor youth offenders and exemplifying the Spirit of Downingtown through service. Laurie Shannon-Bailey, Founder & CEO of CAJA gave a special presentation on the importance and success of alternative sentencing and restorative justice programs for juvenile offenders. She presented a plaque to Corporal P. Antonucci of the Coatesville Police Department for his positive and sustained engagement in community policing and building trust.